Sports are an important activity when growing up. Communities spend large amounts of money to provide various sporting experiences for the kids. I’ve been known to criticize the focus on sports in Nebraska, but when I sit back and reflect on my experiences with it and watching my kids and now my grandkids I’m once again reminded of its value. Sports present us with crucial opportunities in life to develop character. Players with character have stability and can be depended on. They will hang in there even when they are losing. They will try their best even when a come-back is impossible. Paul is talking about the Character of Timothy in Philippians 2:22. He describes him, “But you know Timothy’s proven worth, how as a son with a father he has served with me in the gospel.” Timothy was a teammate who proved himself. Paul could count on him. His “Character” had been proven. That means it’s been tried, tested, and passed with flying colors. He has been through the wars with Paul and has come out stronger. His integrity has been firmly established and proven true. Proven character only comes through tribulations, trials and suffering. Paul has already assured the Philippians that he was rejoicing amidst his trials and encouraged them to do so also. We know, with Paul, the ultimate outcome of our lives so we can persist through any trial or hardship. Through pain and suffering comes “proven worth.” Paul explains this in Romans 5:2-5. He writes, “We exult in hope of the glory of God. 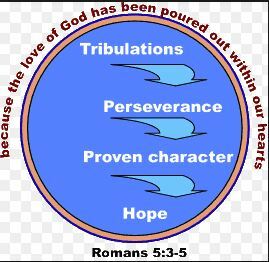 And not only this, but we also exult in our tribulations, knowing that tribulation brings about perseverance; and perseverance, proven character; and proven character, hope; and hope does not disappoint, because the love of God has been poured out within our hearts through the Holy Spirit who was given to us” (Rom. 5:2–5). When we speak of Jesus being the Son of God we mean many different things; His deity, His eternity, His very nature and other divine characteristics. But also He was just like His Father. This is so true that He once told an Apostle who wanted to see the Father that if “you have seen me (Jesus), you have seen the Father.” Paul called Timothy his son. Just as God’s Son was given authority on earth, so too was Timothy given authority that Paul had as an Apostle. An important aspect of this sonship is that just as Paul learned character through hardship, he knew that Timothy had learned that lesson alongside of him. Just like Paul, Timothy put himself on the line with all its risks and dangers and through it all cultivated character through trusting God in hard times and suffering. Grant Richison writes, “Character does not come by floating along in life with the flotsam and jetsam.” Character comes as we learn to trust God through hardships. Character is also developed when we trust God enough to step outside of our comfort zone and do something to stretch our boundaries. We love grooves! They are secure. But stepping outside of our little niches in life we can stretch our faith and build character.